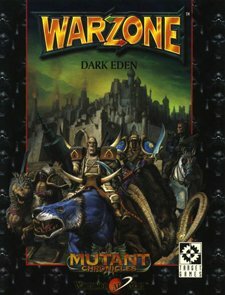 I first worked with John Robertson on a follow up to his Leviathan game that, unfortunately, never saw the light of day but we teamed-up again to create Warzone: Dark Eden. Set in the Mutant Chronicles’ universe, it focused on what life on Earth was like in the game’s grim future. My job was to provide the background, setting and several short stories – an easy job when top artist Paul Bonner was responsible for a lot of the artwork. It was originally published in 1997 and looking back I think I was trying my best to channel my inner Robert E. Howard… albeit in a Post Apocalypse setting.